It’s on occasions like the last weekend in May 2018 when I think I’m living in a Freddy Mercury song. “Is this the real life? Or Is this just fantasy?” If you’d have told me 18 months ago that I’d spend a weekend chatting to, interacting with, and interviewing some of my favorite stars of stage and screen, I would’ve told you you’re mental… but there I was! 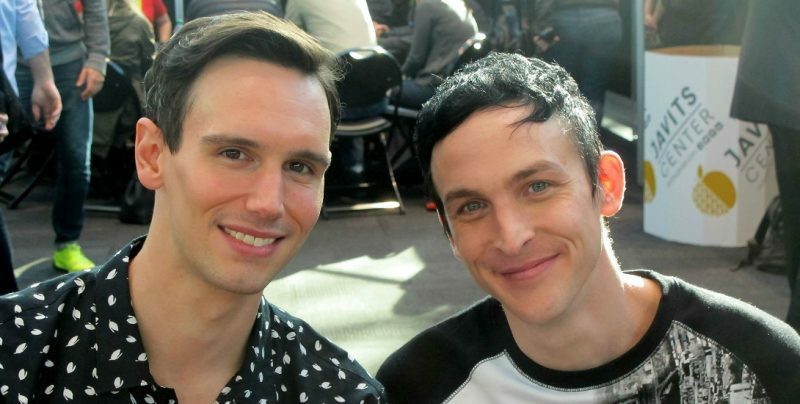 Sitting in a sunny office with Cory Michael Smith, and Robin Lord Taylor. The weekend of May 26th and 27th, my home town of London was host to the second annual Heroes And Villains Fan Fest. This year my son and I spoke to and interviewed over a dozen of our favorite actors, six of them stars of DC Comics TV shows. You can read my conversations with Flash hero Danielle Panabaker, Arrow Villain Kirk Acevedo, Legends Of Tomorrow‘s Franz Drameh and Gotham‘s own Drew Powell right here on DC World. This interview, however, could be the icing on the cake. I really must thank the organisers of the Heroes & Villains event. At the appointed time I met up with the agent who had organised our passes, and scheduled our interviews. He led me to a behind the scenes meeting room, knocked on the door, and inside two of my favourite actors were sitting and waiting for me. What was that line about real life, again? My initial reaction was disbelief, and I was immediately star-struck. To their credit both gentlemen put me at ease, so by the end of the conversation it felt more like I’d been in a room with old friends. At first I couldn’t even get my fingers and thumbs working to hit the record button, but got there eventually. This wasn’t a tech issue, this was interviewer malfunction! Steve J. Ray: Right, it’s finally recording. 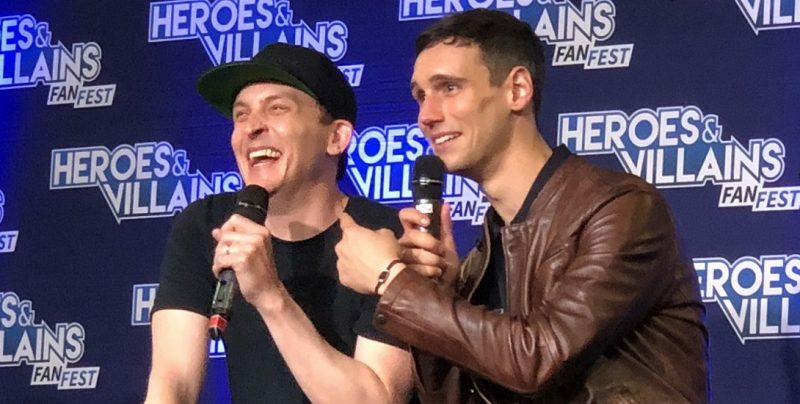 SJR: So, I’m here with Cory Michael Smith and Robin Lord Taylor AKA Edward Nygma and Oswald Cobblepot. First of all, how are you finding London? Have we been nice to you? 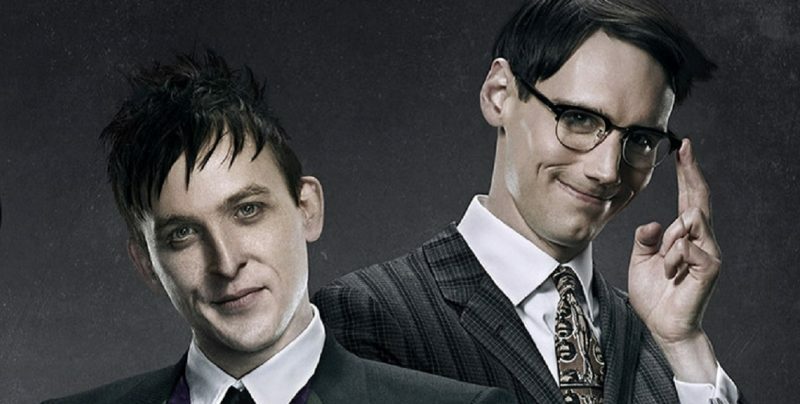 Cory Michael Smith: Oh, yeah. I love it. CMS: This is my fifth or sixth time here, it’s probably my most visited city outside the U.S. I love it! I came early, I’m staying late… it’s great! RLT: Yeah, the same. I think it’s maybe my third or fourth time. It’s just fantastic. When I first came to London I was like oh my gosh, there’s actually another city I could conceivably see myself living in besides New York. SJR: That’s exactly how I feel about New York! RLT: Really? Wow. They feel like sister cities in a way. They’re very similar in many ways. Edward and Oswald… radical departures from the way that anyone has played them before, which is awesome. A conscious decision, or did the producers want you to go down fresh avenues of interpretation? CMS: It was very conscious. In the beginning we had a conversation with the creators about the character, but it’s felt pretty hands off for most of it. 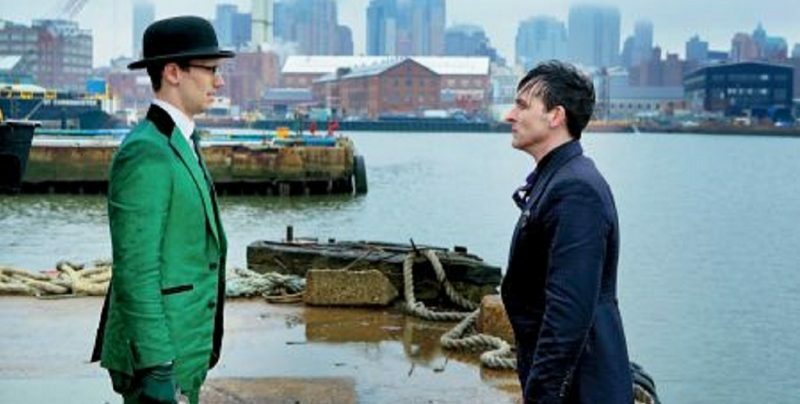 Early on with Nygma we were trying still to find the character, we were so far away from The Riddler. So, we had some course corrections, and tried some stuff and had some different plot lines. 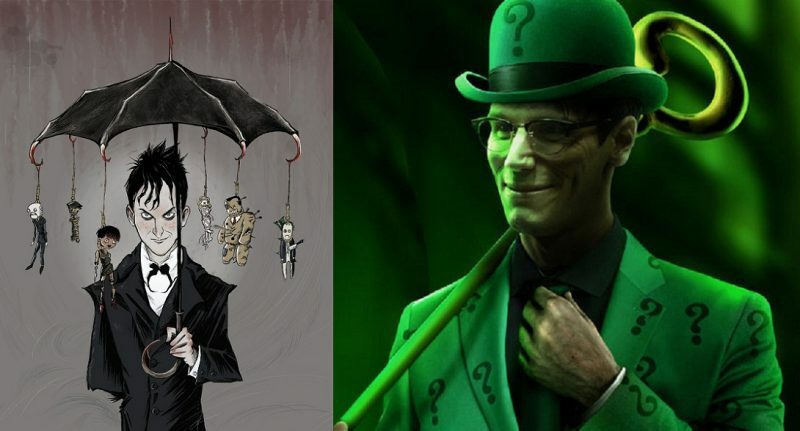 It’s been so fun to go from Nygma to The Riddler. It’s felt like a really exciting evolution. Then the back and forth…. it’s felt like a very organic development of (the) character. It’s been really fun. RLT: I don’t know if you’ve heard, but it was really fascinating the way they cast the show. When I auditioned (Robin looks over to Cory) and I don’t know if it was the same for you, but we were not allowed to see the script. We weren’t even supposed to know what the project was, so they had sent out just scenes that were written just for the audition, with very little description. When I came in to audition I made choices not knowing it was The Penguin. I was given a scene, and so… OK, here’s what I’m gonna do with that, and it just happened to be exactly what they had in mind. And that was the same for all of us, they didn’t want us to come in with any expectation or any thought about what came before. So it was very intentionally, made to be a departure for all of us, from the characters as we knew them before. SJR: That makes so much sense. That’s a much more natural way to form a character naturally. One of my favorite parts of the show is how organic and natural it does feel from a character performance standpoint. I was speaking to Drew (Powell) earlier, and having a real, physical Solomon Grundy, rather than a CGI monstrosity was brilliant. Roses Are Red, Violets Are Blue. 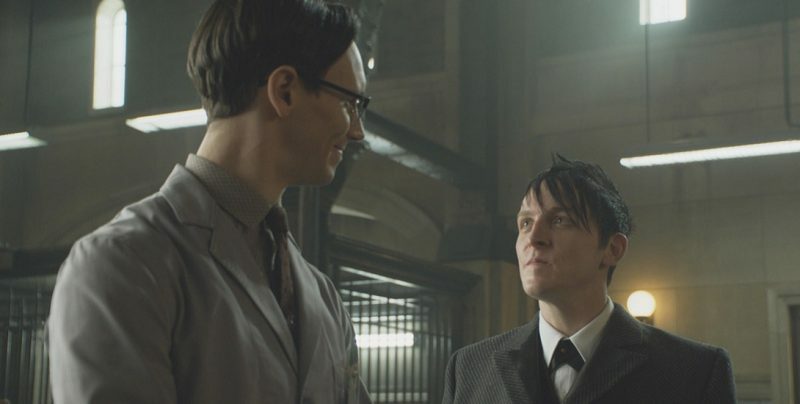 I Have Multiple Personalities… And So Do I.
SJR: Obviously duality is a huge theme in Gotham, and in Batman’s universe. Robin, you started out as a good son, a family man, forced into becoming a monster. Cory, you were a nice, stand up guy, working for the police. You then had your heart broken, and your mind destroyed by guilt, forcing you to become the Riddler. Has it helped you, as actors, playing these two radically different personalities, that are the same person? CMS: Absolutely! After four years of doing this, I feel way more in command of my body, and my voice, and there’s something really exciting about being on a TV show that feels so… operatic, and big. We both come from a theatre background, and you have the allowance to really fill a space when you’re doing theatre. That’s rare in TV and film today, to be granted the authority to really flex your muscles that way. To learn how to do it on-screen, in a way that is focused, but still like… eruptive… it’s been a great education. RLT: Yeah, definitely. It’s been great. There’s the idea that, when you’re on film that everything has to be smaller. This show has completely stripped all that away. SJR: Every episode feels like a movie, and every performance is full of life. RLT: Exactly, it’s larger… it’s like the largest performance you can give, and they want that. They encourage us to be big, and to be brave and put it all out there. That’s what I’ll take away from this whole experience. Feeling so much more confident in who I am, and knowing that when I walk into a room, I know how to command a space now… I don’t think I really understood that before. SJR: Would either of you like to have the comic-book toys, like the staff, or the umbrellas in the final season? RLT: Yeah, he gets a cane, I get my umbrellas. CMS: Give me my cane! RLT: I’d love the helicopter umbrella, that would be great. Also, I’m really hoping that we get the monocle next year. In the storyline it’s an injury, so I don’t know who would cause it in the show (points at Cory) probably him… (We laugh) I think it would be fantastic! Especially since it’s wrapping up, I feel like, by the end, all of the pieces are gonna start coming together for all of us. CMS: (To Robin) Do you plan on gaining 50 lbs this season? (We all laugh) Can you imagine? Oh, my God! SJR: Like you said, Robin, sadly things will be wrapping up. We’ve heard stories from the show-runners saying that characters like Mother and Orphan / The Lady Shiva and Cassandra Cain are coming onto the show. Are you guys excited about that? Some new blood? 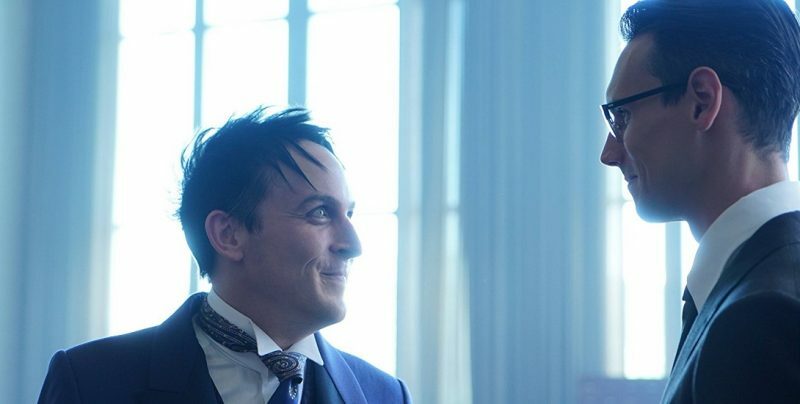 RLT: I’m excited about new blood, but really what I’m hoping is, since it’s the last season, that even with the introduction of new characters, we’ll still be able to come back and focus on the core family, the core group that has been there since the beginning. SJR: The backbone of the show. RLT: Exactly. That’s going to be really gratifying, and it’s going to be very emotional. I’m already anticipating that. CMS: I know, It’s a lot.. It’s a lot. SJR: The fans are, obviously, really sad about it ending too. I’ve been reporting on the show since it started, and one small comfort is that you’ll be going out with a bang, and not with a whimper. CMS: Oh… it’ll be epic! RLT: It’ll be fantastic. Also, just to know that it’s the end. I’ve been saying that once the show is done and time goes on, new people will still be discovering it. I’m just so glad that they’ll be able to watch it, all five seasons as though it’s a movie. The fact that we will have an ending, and that it will be, over five years, the big arc of the whole thing. I think it will be really great. RLT: Hey, you never know… maybe Netflix will pick us up. SJR: It’s great seeing you both so casual, and relaxed. You’re usually in these sharp suits, and all dressed up. The costumes in the show are great! Do they feel as good to wear as they look? CMS: Oh my God, yes. It’s extraordinary. We’re fortunate to have them custom made, and when you put them on you feel… powerful. CMS: It feels right, and the fabric is beautiful, or it’s glistening, or it’s velvet, or whatever it may be. It just feels rich, and you can walk into a room and really own the clothes. RLT: Yeah. It’s like putting on the skin of the character. I love working that way too, to be able to go from the outside into the emotional interior. To be able to put on the suit, have the nose, and then the hair. 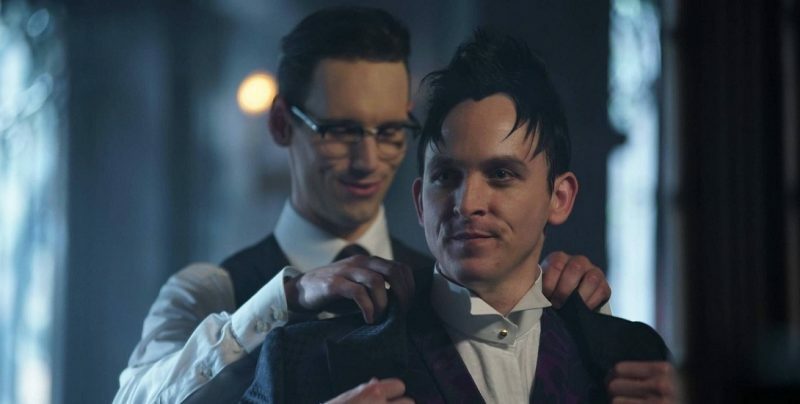 It’s like all these pieces come together, and then I’m Oswald. It feels really great. SJR: What was your relationship with comics, from before working on Gotham, and since? CMS: Before the show, I didn’t have a relationship with comics, we didn’t grow up with them in our house. My brother and I didn’t read them. Now… (Laughing) now I have a collection! Particularly of Batman. I’m mostly focused on reading Batman comics, and now I have a little library that I’m pretty proud of. RLT: Yeah, same. I wasn’t a huge comic-book person as a child, but I was obsessed with the movies. Now it really is so rich. The art, the creativity and background of these characters I find so fascinating. It really feels like it’s mythology… the mythology of today, and I think it’s so exciting. The fact that it inspires both myself, and other people, that’s exciting. So, to close. Any final message for our readers, your fans, from Cory and from Robin. What would you like to say? CMS: Join us on the ride to the finale. It’s gonna be epic! RLT: I love you, and thank you. SJR: And we all love you, and thank you. Thanks guys! SJR: Fingers crossed, we’ll see you next year!